Your loader arms should remain rigid when you move with a load, and hydraulic hoses should be protected from the hazards of a jobsite. Our durable, patented lift-arm design and a choice of lift path help you meet the unique demands of your job.Bobcat's unique lift arm design makes them the most durable in the industry. The design keeps every pin at each pivot point in the same plane. Additionally, the pins are supported on both sides vs. just one side (cantilever design) that you'll see in other machines. The result is that Bobcat loader lift arms have less lateral deflection (side-to-side lift arm movement) and reduced load on the pins themselves. It results in less wear and prevents unwanted spillage of material. Hoses are routed through the loader arms and frame uprights to minimize potential snag points. A loader with a vertical lift design is a better match if you use the machine to load dump trucks. You’ll be more efficient, since you can dump material into the centre of the truck. You can continually load the truck from only one side, instead of spending more time loading from each side of the truck. With a vertical lift machine, the load stays closer to the machine throughout the lift path. A vertical lift loader can safely lift more than a loader with a radius lift path. The weight remains closer to the machine's centre of gravity, giving a vertical lift machine a larger tip capacity. Therefore, a comparable vertical lift machine with a higher ROC makes it ideal for placing pallets, especially those loaded with heavy materials such as bricks or blocks. 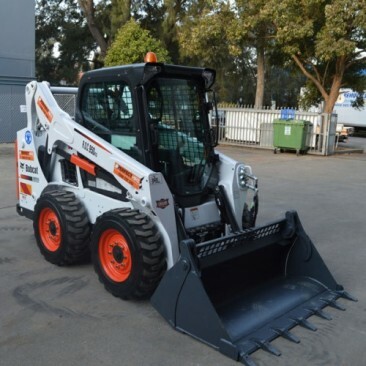 On the Bobcat vertical lift design, the loader arm will not extend past the rear of the machine during the lift cycle. With some competitor machines, the lift linkage extends beyond the rear of the machine when raising the lift arms. If you work in a confined area, this could potentially cause damage to the machine or property around it. Radius lift path provides maximum reach at truck bed height. Arm movement forms an arc. More than 80 percent of that arc delivers better reach at truck bed height. A radius lift path excels in jobs at mid-range heights, like dumping over a wall, backfilling or unloading flatbed trucks. If you spend a lot of time digging and excavating, a radius lift path may be a good match. A radius lift path loader will keep better outward pressure on the bucket when the lift arms are completely lowered, and the machine will perform better when digging in different soil conditions. The radius lift path loader provides the greatest reach advantages from the operator's eye level and down while sitting in the seat of the machine. A radius lift loader has fewer greased pin locations than vertical lift loaders, resulting in fewer potential wear locations and reduced maintenance needs. This Bobcat was quality. It never missed a beat on the job we were on.